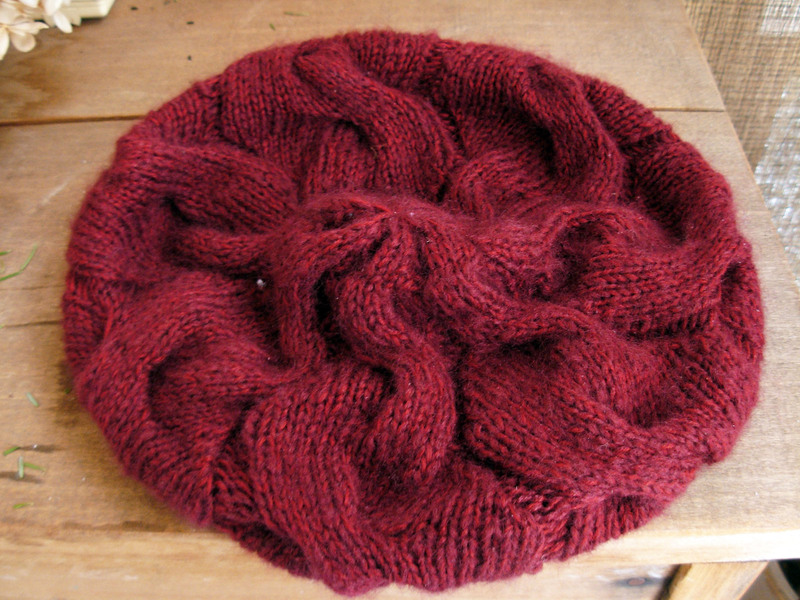 When I finished my Monkey Bread Hat back in 2012 (wow–was it that long ago!? ), my mom almost immediately wanted one for herself. It took some time–first to find yarn she liked, then, shamefully for me to get started. And it was a chore to get past the start. I had trouble with the ribbed brim, and had to rip out and restart twice–first because it was just too tight all around, second because while the ribbing was fine, the cast one was still too tight. And this was not a nice yarn for ripping (or tinking, for that matter) back; the mohair just wants to stick together all the time. But finally I managed forward motion, even finishing before the worst of winter hit. My mom’s been wearing it ever since, but I did manage to snap a finished picture. Modifications: Ah yes. I nearly forgot–I finished this hat twice. The first time, I followed the pattern for the small size faithfully. No good – while the brim was perfect (after the third try), it was overall too short. I did a quick test row to determine how many rows I could add on with the yarn I had left and then ripped back to before the decreases. I didn’t have quite enough yarn for a full additional pattern repeat, as with the large size, so I had to take one row out of each section (in between the cables). I also didn’t want to rip more than I absolutely had to, so rather than going back to the first cable and flipping its direction so that I could just follow the charts for the rest, I had to mentally flip all the remaining charts after the first two cables. But I think it worked out perfectly fine. My mom’s very happy with her new hat, and I’m vowing to stay away from mohair for anything fitted!